In a grand reveal at this year’s Blue and Orange Madness during Pepperdine’s annual three-day Waves Weekend festivities that took place from October 13 to 15, Pepperdine University Athletics introduced the new Willie the Wave—the University’s official mascot—at Firestone Fieldhouse alongside the men’s and women’s basketball teams. The newest iteration of Willie the Wave features a smaller head size, a more toned physique, and athletic footwear in exchange for the flip-flops the mascot has been known to sport. Willie’s updated wardrobe also includes basketball and volleyball uniforms, as well as general workout apparel. 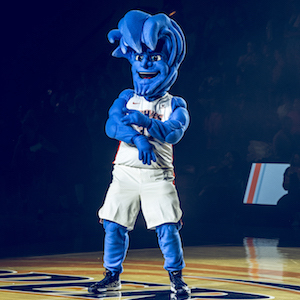 Plans to redesign Willie the Wave began in spring 2017, when Pepperdine Athletics administrators decided to order a new mascot costume as a result of wear and tear. Rather than selecting the same Willie the Wave attire featured in the past, the department partnered with the University’s mascot vendor to create a more modern costume using updated technology, fabrics, and other essential materials. To learn more about Willie the Wave, visit the Pepperdine Athletics website.